Retail sales in November grew at the fastest pace since June, representing the latest in a series of indicators pointing towards healthy U.S. economic growth heading into 2014. Employment gains last month, along with a stronger-than-expected third-quarter GDP figure, lends credence that consumers will be larger contributors to economic expansion in the coming quarters. Additionally, an emerging legislative compromise will set the budget for two years, clearing one of the most significant hurdles faced by the economy. While businesses and consumers will enter 2014 on solid footing, they will likely have to cope with higher interest rates as the potential tapering of the third round of quantitative easing becomes more likely. Nonetheless, the capital markets have already accounted for much of higher borrowing costs, limiting the impact of the taper. Consumers are spending more despite an overall lack of confidence in the economy. In November, the consumer confidence index retreated two points to 70.4, the lowest level since April, when sequestration commenced. 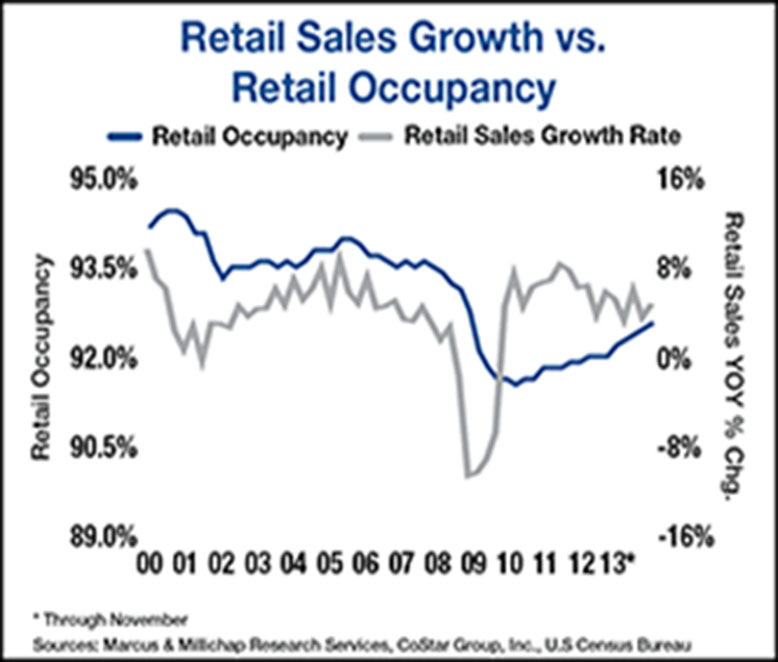 The combination of healthy retail sales and low consumer confidence indicates that additional pent-up demand is prevalent. Over the past few years, households have deleveraged, the equity markets are concluding a six-year bull run and rising home prices are re-establishing the “wealth effect.” As unemployment drops further in early 2014, retail sales growth should hasten. Despite strong retail sales growth, the recovery in retail vacancy has largely been masked by heightened vacancy in neighborhood/community centers. These smaller, open-air centers will record double-digit vacancy at the end of this year, before vacancy falls into the mid-9 percent are in 2014. Power centers, meanwhile, will post sub-6 percent vacancy next year, facilitating a third year of rent growth. While single-family home developers are proceeding cautiously, multifamily builders are bringing thousands of new units online this year and next to meet demand. The absorption of new units will lift apartment demand 1.2 percent next year and 9.3 percent above the recessionary trough. Many of these new households will spend more freely in furniture and appliance stores. This entry was written by marcusmillichap, posted on December 13, 2013 at 11:05 pm, filed under Uncategorized and tagged CRE. Bookmark the permalink. Follow any comments here with the RSS feed for this post. Post a comment or leave a trackback: Trackback URL. Your information is very useful in any real estate direction, sale, buy, lease,investment and may more. I am certainly glad to hear that consumer confidence was looking up to close out 2013, which certainly was an intriguing one for many reasons. However, your closing statements have got me thinking about something I read about following the annual real estate summits that closed out the year. Despite many predicting a continued increase in home sales this year, some experts theorize that we’ll see another dip in homeownership rates during 2014.